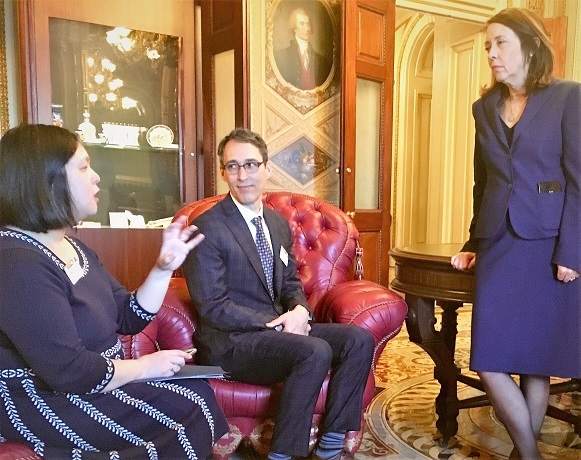 Darcy shares some of her takeaways from her recent trip to Washington DC for the 2019 National Anti-Hunger Policy Conference. HIP is best known for providing nutritious meals and nutrition education. This work matters to us. However, it would be a disservice to our community if we didn’t take a larger view of the problem of hunger and advocate for anti-hunger policy solutions. This February, I traveled to Washington DC to be a part of the 2019 National Anti-Hunger Policy Conference. At this annual event, hundreds of advocates come together to brush up on policies, share resources, and of course, lobby! After visiting twelve law makers in one day I was surprised by two things. First, I was surprised how exhausting twelve back-to-back meetings that are spread out across the capitol can be. I could definitely cancel my gym membership and just spend my time running between the different congressional buildings. The second thing that surprised me is how different the experience of visiting the legislators were than what I had imagined. We learn in school how the government works, and how laws are made, but it’s a very different thing to step into the process. To give a cooking metaphor, imagine you have never cooked a meal in your life, but you had been taught most of the basic culinary techniques. I’d imagine you’d have moments of thinking that it’s really not all that hard, and that you should have started cooking long ago. And at the same time I bet you’d burn or over salt the first thing you ever tried to cook. My experience in DC wavered in this same space. In one meeting it would all seem so clear; legislators are hungry for good information, and if I advocate for my preferred solutions to a problem, they’ll transfer my wishes into policy actions. And then, within the same 15-minute meeting, I would struggle to remember the name of a piece of legislation, or forget one of my most important points I was going to make. That said, I could see the cumulative value of our lobby group’s presence. I may not have been the most eloquent or persuasive speaker, but it was important that our legislators heard my voice and the voices of thousands of people that we serve who are struggling to put food on their tables. I left with the feeling that my voice mattered and with the confidence that I can do it better next time! I’m sure you did better than you feel you did! Just speaking up as an advocate for HIP gives you a platform; the fact you were face to face, sharing first-hand factual information in conversation is a huge point in your favor. Just the fact that you and your fellow conventioneers came from all over the country is impressive. I’m sure legislators are used to and not at all offended by people new to Washington. It might be a refreshing change for them from slick, ulteriorly motivated professional lobbyists.